At the end of 2015 many expected that the Federal Reserve might raise interest rates several times in 2016. This was not an unreasonable guess as the December 2015 economic projections of the members of the FOMC suggested that most thought increases in the targeted Federal Funds were likely. As it turned out, there were no additional increases in the target through November, setting up the December meeting as the last likely opportunity for a 2016 increase. While we discussed the potential for farm level impacts of an increase back in 2015, we thought now would be a good time to take another look at farm level interest rates and begin to think through some of the implications of a potential interest rate increase. Where are Farm Level Interest Rates? Like most interest rates, farm level interest rates remain quite low. Figure 1 shows farm operating loan made by banks in the 10th Federal Reserve District (Kansas City Federal Reserve Bank) by quarter since 1987. As is apparent the long-term trend for these rates has been down. However, the downward trend has flattened considerably since rates fell below 6% in the fourth quarter of 2012. Since then they have held steady in a range between 5.61% to 5.9%. In the third quarter, they were reported at 5.66%. Figure 1. Average Interest Rate on Operating Loans, 10th Federal Reserve District. Source: Ag Credit Survey, Kansas City Federal Reserve Bank. Although the decline in rates stalled in 2012, current farm level rates are as low as ever recorded in this data series. Of course the rates experienced by individual borrowers will vary according to credit risk and other factors, but it is pretty clear that most borrowers are probably obtaining financing at some of the lowest rates observed in their farming careers. We could also show graphs for intermediate loans and real estate loans in the 10th district, but will spare you the details and just mention that they tend to exhibit similar movements and tend to have slightly lower rates than those for operating loans. As we pointed out in 2015 post on interest rates, the clear majority of non-real estate loans made to farmers carry floating interest rates. This means that the cost of this credit will begin to adjust upward if rates increase. Although this sounds a bit scary and would lead to higher costs, the actual impact on costs would likely be minimal unless rates were to increase by more than 100 basis points. Instead, it is likely that the impact of higher rates will be felt more heavily on the capital expenditure side of the farm business. Higher rates mean that the cost of capital for equipment will likely increase, when capital expenditures are already under pressure. Likewise, as we have frequently noted, increases in longer term interest rates could have negative impact on the farmland market. Whether rates will increase enough to cause disruptions there is an open question but one that bears watching as we move into 2017. The last time that the Federal Reserve was seriously considering increasing interest rates we drew the following conclusions which we think are still relevant today – just replace 2016 with 2017. As the Fed ponders increasing short-term interest rates, many agricultural producers are increasing their use of credit. If rates increase, it will mean higher costs for many producers. The practical issue is whether this increase is enough to make a large difference in the profitability. Our view is that rates are not likely to rise enough in the short-term to cause large decreases in profitability. Overall, it is not likely interest rate increases on non-real estate loans will place a huge financial burden on agricultural producers in 2016 2017. However, it adds another cost increase to the ledger in a period where significant cost reductions are needed. The bigger question will likely be how many producers can remain credit worthy in a period of rapidly declining profitability. At this time we would also like to add a few additional thoughts. 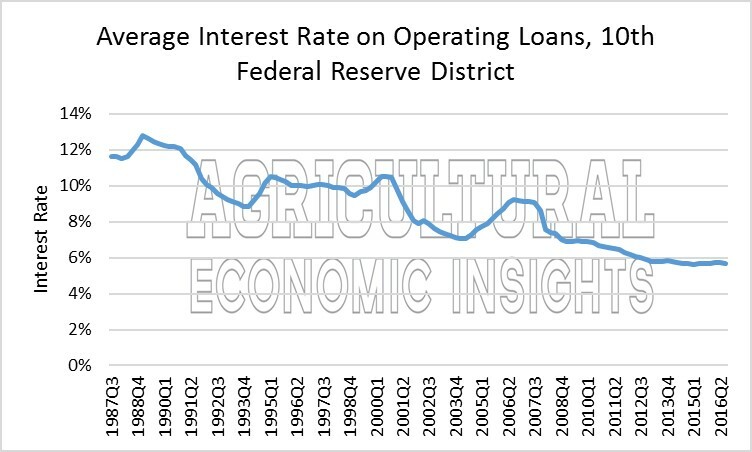 It is important to note that agriculture has benefited from low interest rates. Changes to the low interest rate environment could alter the farm economy in ways that are difficult to predict. The actual out of pocket cost to most farmers will be rather low unless rates start to increase more rapidly. However, the indirect impacts of interest rate changes could be quite substantial. Interest rate changes have the potential to adversely impact the exchange rate, which would put pressure on trade. Given the large global commodity stockpiles, adverse movement in the exchange rate would be another headwind to U.S. sales, and exports remain a critical demand factor for most U.S. commodities. Interest rate changes also have the potential to pressure farmland values. Both of these factors would be unfavorable to agriculture meaning that we should pay close attention to movements in interest rates and how they are influencing the agricultural economy in 2017. In short, rising interest rates can impact agriculture in many ways – from operating expenses and farmland values to exchange rates and trade. We noted that interest rates warranted monitoring in 2016 and that will again be the case in 2017. All eyes will be on the Fed’s decision later this month and into 2017.